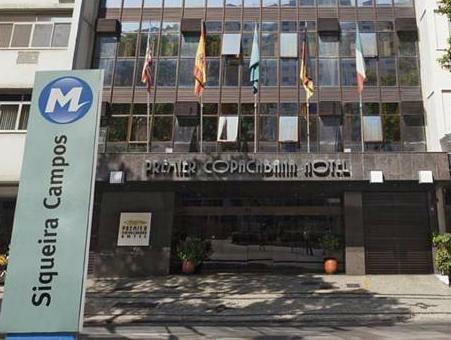 ﻿ Premier Copacabana Hotel, Rio De Janeiro | FROM $41 - SAVE ON AGODA! "Good location, within 5-10 mins walk to the beach, surprisin..."
This hotel has elegant suites and a great location 1640 feet from Copacabana Beach. The panoramic rooftop pool offers views of the iconic Christ the Redeemer Statue, 1.9 mi away. Rooms at Premier Copacabana Hotel have light cream colors and chocolate brown furniture. All are equipped with LCD and cable TV, air conditioning and free WiFi. Guests can enjoy a delicious caipirinha from the bar, while relaxing in the winter garden, designed by Burle Marx. The restaurant serves international cuisine and a daily breakfast with croissants and eggs. Siqueira Campos Metro Station is in front of the hotel. Copacabana Fort is 2 mi from Premier Copacabana. Santos Dumont Airport is 6 mi from the property and Galeão International Airport is at a distance of 14 mi. For payment/pre-payment with credit card, hotel requests a billing authorisation form to be completed by the guest before its arrival. Hotel will send the form by email to the guest as soon the reservations is confirmed on the website. Please note that the double bed is confirmed upon availability. If not available, guests will be accommodated on a room with 2 single beds that can be put together and transformed on a double bed. Please note that Premier Copacabana Hotel's parking can only accommodate regular-sized cars (parking does not fit trucks and SUVs). Also note that parking is subject to availability as parking spaces are limited. Baby cots are available upon reservation. Transporte publico cercano al hotel: metro, buses, taxis. El hotel posee una excelente relacion calidad / precio. La atencion del personal y la limpieza y mobiliario del hotel es muy buena.